McGee in Italy before he came to live at Anacan. 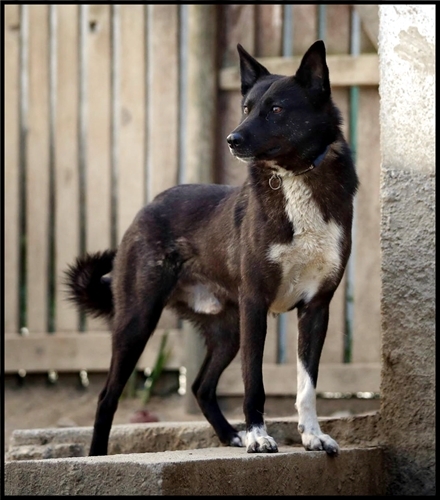 Over the years we have imported new Canaan Dogs when we felt the need to expand our genepool. We were at a point when we needed to find another dog when Isabella Zirr (Velikayas)i contacted me and offered me McGee. Perfect timing! So Richard drove to Italy October 2018 to pick him up as he felt it would be less stressful for the dog than flying him here. It took Richard two days driving there and two days driving back (including the ferry trip.) Then McGee found himself in a new country, with new people, a new language and new other dogs to get used to. As he settled in he got a new nickname - 'Cuddles' - as when I called him back to me after his run around the field with his kennel mate, our 'Joy', I would tell him come for cuddles and he learned to do so. 'McGee' is a small dog, only 54 cm (21-1/4 inches) tall, but he is masculine, square, well-constructed, typey, and moves in the effortless way we like our Anacan Canaans to do. We have bred him to our 'Divina' for his first mating. 'Divina' has had one litter previously, sired by our 'Caiser'. Those pups are 1-1/2 years old now and have turned out beautiful and their owners are very happy with them, so it will be very interesting to see what 'McGee' will produce with her. We will also give 'McGee' a go in the show ring when we feel he is ready and look forward to having some fun with him in there. For now we will enjoy our cuddles with him.